elizabeth zimmermann pattern from the opinionated knitter. 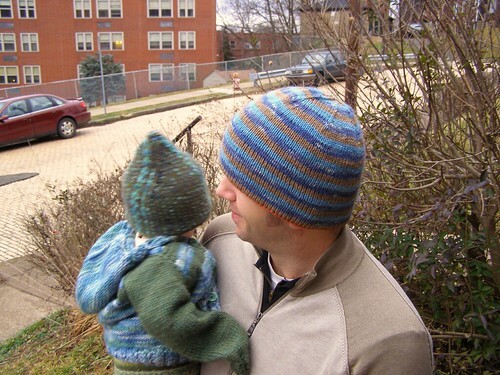 every year i challenge myself to make an even warmer hat for jeremiah. he’s a great person to knit for. he wears whatever i make him and currently has a hat for most temperatures in fairbanks. but 40 below, that’s a hard one. so here’s an attempt. 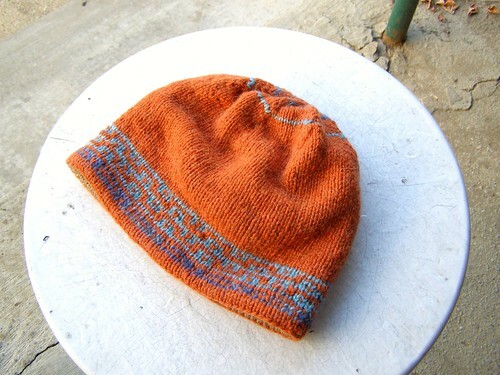 side one – colorwork. the orange is autumn house farms 50% wool/50% alpaca, dark blue is my hand dyed lamb’s pride, and lighter blue is snapdragon worsted. side two – stripes. same blues as above and some commercial wool (maybe cascade 220?). ben claims that this hat is super duper warm and, when you think about it, it should be. bulky yarns are warm because they only need to be loosely spun to be yarn and that leaves a lot of room for air in the yarn. 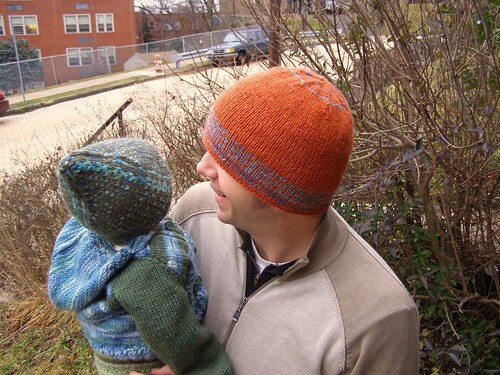 this hat is warm because it’s a double layered hat with space in between the layers for air. 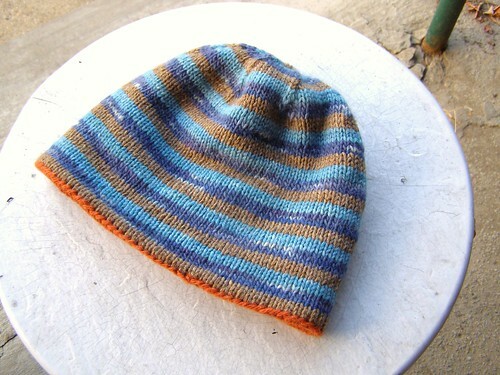 i wonder if this style of hat would be warmer than a bulky hat? also, it has a bit of alpaca and mohair in it, so that helps. raveled here. p.s. here’s this month’s newsletter! I love this hat!! It’s a two-looks-in-one…. fab!